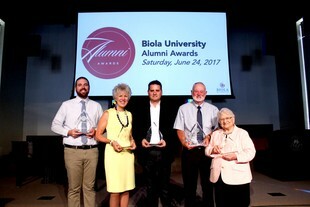 The 2017 Biola University Alumni Award Winners were honored today in a ceremony during Alumni Weekend — an annual homecoming event for Biola alumni. This year’s recipients work in a wide-range of fields and include Anne Abajian Sandoval (’48), Luke Glaze (’07), Mark Joseph (’90), Col. Jay Earles (Psy.D. ’94), Shelley Leith (’80), and Allan Arensen (’71). Read about this year’s recipients below. Anne Abajian Sandoval (‘48) received the 2017 Biola Lifetime Achievement Award. She was born in Los Angeles to Armenian immigrants and spent her early adult years helping to build the P-38 aircraft during World War II. After attending Biola, where she was active in student leadership, Sandoval married and served in ministry where she played an integral role in building Sunday school programs. When her husband died soon after being recruited to build the new Christian education department at Western Seminary in Portland, Ore., the seminary’s leadership asked Sandoval to take his place. She dedicated the next 25 years to teaching and leading in the department. In 1977, Sandoval was the first women to receive an honorary doctorate from Biola. At 93, she is still active with her church, community and family. Luke Glaze (‘07), who earned his degree in intercultural studies from Biola, started the social business Green Creations in Jordan in 2009, and received the Young Alumni Award. The business provides employment for women in poverty, educates the community on environmental issues and helps provide a community where the love of God is experienced. After six years Glaze returned to his hometown of Salem, Ore., and is launching another business, Sparrow Furniture, to provide transitional employment to the increasing refugee population as they learn English and build their resumes with practical skills. He and his wife, Jocelyn (‘06), have two children. Mark Joseph (‘90) is an award-winning film and music producer, author and founder/CEO of MJM Entertainment Group and Bully! Pulpit Records. He received the 2017 Cultural Impact Award. Over the course of his career, Joseph has worked in the development and marketing of 40 films, including “The Chronicles of Narnia,” “Ray,” “Holes,” “Because of Winn Dixie,” “Son of God” and “Little Boy,” and served as producer for the award-winning soundtrack for the “Passion of the Christ.” He is co-founder and a member of the board of directors of the Damah Film Festival and the Hiroshima International Film Festival and is the author of four books. He lives in Southern California with his wife and five children. Col. Jay Earles (Psy. D. ‘94) is the chief of the Department of Behavioral Health at Dwight D. Eisenhower Army Medical Center (DDEAMC), the president of the American Board of Clinical Health Psychology and a former clinical psychology consultant to the Army surgeon general. Earles received this year’s Rosemead Alumni Award. At DDEAMC, Earles leads five outpatient behavioral health clinics and two inpatient programs, provides clinical services, supervises psychology interns and residents, teaches didactics and supports the center’s behavioral health research mission. Over the course of his training and career, he has served the Army in a range of roles and has co-authored scientific papers and a book chapter. He and his wife, Kim, have two children and are active members of their church. Shelley Leith (‘80) is the national director of church relations for Zondervan, and her training courses and resources have helped more than 10,000 churches implement year-long intergenerational discipleship programs such as “The Story to Believe.” She received a Cultural Impact Award. She previously served on staff at Saddleback Church, where she developed church training materials for the 40 Days of Purpose campaign used in over 30,000 churches. She is the author of “Character Makeover” and “Head to Soul Makeover” and speaks across the country on character, self-esteem, marriage and motherhood. Leith and her husband, Greg (‘78), live in Southern California and have five children, all Biola alumni. Allan “Lanny” Arensen (‘71) served with Africa Inland Mission (AIM) for over 40 years, first as a missionary to East Africa and later as the international director of AIM. He received the 2017 Clyde Cook Missions Award. Before retiring to Colorado, Arensen and his wife, Carla, had the responsibility to recruit, screen and prepare missionary candidates in their pilgrimage to Africa. They cared for the financial and administrative details for members and raised awareness in churches, schools and other groups. Over the course of their ministry, the Arensens served in 15 different countries. Awardees are selected through a nomination process and decided upon by the Office of Alumni Relations and Biola’s Executive Alumni Board. Click here to view the winners from last year. The Alumni Board announced the recipients of the 2017 Alumni Awards in the Spring edition of the Biola Magazine.